But now that the legally regulated cannabis business is booming, we thought an even better way to honor it would be to take the pulse of this nascent industry. Here is my recent daily dozen interview with Michael Bologna, the co-founder of high-flying legal cannabis consultancy Green Lion Partners. GS: Happy Weed Day, Mike. Are you lighting up or ingesting for the occasion? And if not, why not? You do live in Colorado, right? MB: Not yet. I’m moving from Boston to Denver within the next six weeks. We did strategically planned a trip to Denver to finalize our office space and set up a few meetings — conveniently around 4/20. So yes, I will definitely be sampling the local products once our work is finished up. I don’t usually consume while working but that is personal preference, not something I expect everyone in this industry to adhere to. I say, as long as work is getting done properly, enjoy! GS: Where will the cannabis industry be in one year? Five years? Ten? MB: In one year, we hope that as many of nine more states will have passed some form of medical or recreational legislation, which would be a massive increase. Especially with the potential for California to pass and approve recreational adult use, we are opening the industry up to a big percentage of Americans. It is hard to project five and 10 years out because of how quickly things move. We could be anywhere from full federal legalization to stricter laws instituted by the next president. As I mentioned, I think the momentum is too strong to stop the movement, but it is so new and so dynamic that putting projections on it is difficult. That is one of the most exciting elements to working here. And we are really bullish on software technologies and big data aggregation, because those are two elements that are actively avoided by people in the illegal markets. GS: What do you think is most important cannabis story of the year so far? MB: The rejection of the oligopoly legislation in Ohio where voters rejected a bill for recreational cannabis. On the face, it feels like a loss for cannabis proponents, but I feel it showed that voters really care about responsible and sustainable legislation that offers the opportunity for the whole community to succeed, not just a small number of wealthy individuals involved with drafting the bill. On a personal note, we’re involved with the Whoopi & Maya medical marijuana line in California, so I would say Whoopi’s official entrance to the space is pretty important. She’s always been a vocal advocate. GS: What does Green Lion Partners do that’s better or different than other firms in the biz? In other words, what’s your secret weapon? MB: I would say our unique blend of experience in outside industries, ranging from aerospace engineering to coffee manufacturing to television production allows us to bring insight from other worlds that can be applied to cannabis. We also focus on social entrepreneurship and try to involve ourselves with causes that improve the industry and mitigate the negative environmental effects of cultivation or offer medical benefits, which really resonates with a lot of people involved in this space. GS: What could go wrong in this nascent industry? In other words, what keeps you awake at night? The country has shown incredible momentum toward full scale regulation. I’m less concerned about a political regime change in the short term than the damage that they can do to banking and investment in the long term. If an anti-cannabis president is elected, he or she will likely be unable to stop the individual states from passing their own policies, but he may be able to hinder our ability to access federally insured banking even more so than what we currently face. MB: She was certainly shocked initially when I told her I was leaving my consulting job with a Microsoft partner. But now she has gotten to see my passion and the legitimacy of the work we are accomplishing with GLP and fully supports us. These days, her worries lie more with how I will pay my student loans and around the fact that I’m moving so far away from her as I leave for Denver. GS: Do you have to be a stoner or former stoner to be successful in this business? Being an active consumer is definitely not a prerequisite to success, and we know some talented individuals in the space that don’t partake. That said, I think that the majority of people involved have smoked before and many after hours meetings include a smoke session. (Smoking) allows for a common ground and camaraderie in the same way that people love going out to happy hour after a long day. Overall, we really focus on removing the legitimacy of the industry from the stoner mentality. We like to focus on the fact that we’re business people who also happen to enjoy everything that cannabis has to offer. GS: You are advisor to a number of cannabis firms, including FlowHub and VapeXhale. What do you look for in a partner or client? MB: Green Lion Partners focuses on companies that can scale with the industry as it evolves in the coming years. We want groups that have a long-term vision of how they fit in that landscape and that maintain our approach of improving the world around us through active social entrepreneurship. Most of the companies we work with are focused on a specific element of the industry and strive to be the absolute best at it, rather than a widespread potentially messy attempt to solve every single issue that the industry may face. GS: What is up with the green lion imagery? Ferocious but stoned? Wild and trippy? What is the thinking around the logo? MB: The Green Lion name and logo were designed to position ourselves as a trusted and strong brand. We wanted to project an image that was imposing but also recognizable. The mane of the lion is reminiscent of a cannabis leaf because we didn’t want to fully ignore our industry, but we still wanted to break from traditional weed leaf symbols. GS: What is the one thing people don’t understand about your industry? MB: They don’t get the level of business sophistication in the industry. We actively work to remove the ‘stoner’ stigma and perception that the general public has regarding cannabis. However, a large number of the companies involved are highly technical and filling a lot of the same roles — consulting, financial services, supply chain solutions and so on — roles that are prevalent in any major industry. We look forward to a day where the ‘high and tie-dye’ jokes subside and people really ask about the business we’re accomplishing. GS: So how did a (presumably) nice boy like you end up in a (presumably edgy) business like this? My business partner, Jeffrey Zucker, and I have wanted to work together since we met at Boston University. We were G-chatting about this industry and its future as consumers and advocates for legalization, and we decided to jump in. While many may consider this business edgy and even risky, we really believe in the opportunity for social change that cannabis can offer: everything from reducing prison time for non-violent offenders to increased tax revenues routed to schools or parks, not to mention the extensive medical benefits cannabis brings. That’s an upside really isn’t seen in most industries. Of course, the rapid growth and profit potential doesn’t hurt, either. GS: You say on your biography that you are a Red Sox fan who was born and raised in New York. Nice. How do you think the Sox will do this season? MB: Much like our industry, I feel that the Sox have some great young talent and a promising future. However, I do think we’re in for some learning curve issues and may not have the pitching to take us as far as I would hope. The goal is playoffs, but after a few years in the basement of the AL East, I’d be happy with a competitive season. GS: Okay, I’ve got to ask a bonus question. Bong or splif? MB: I’m not a big tobacco guy, so I’ve got to stick with the classic bong. 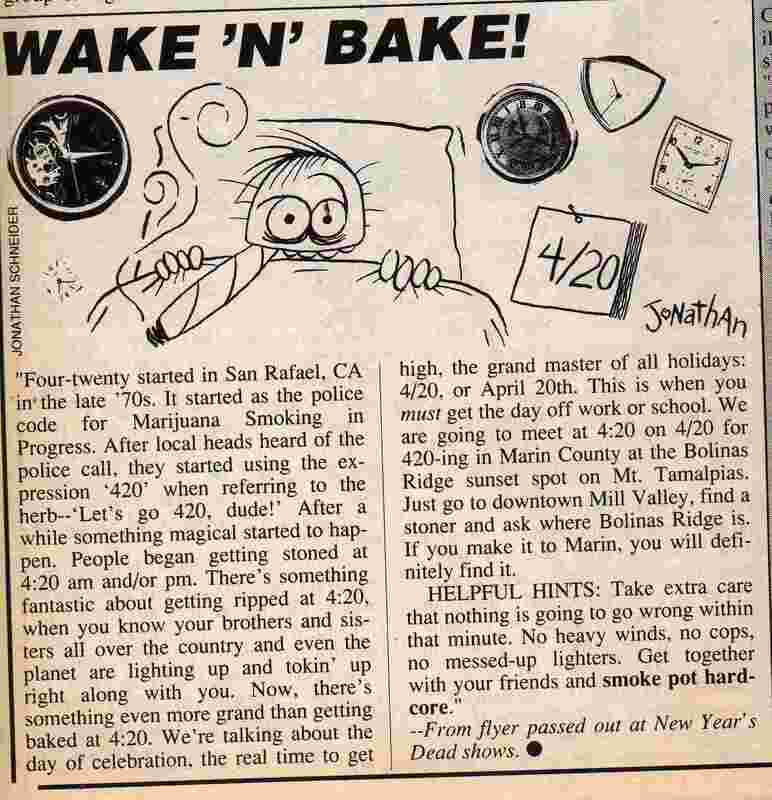 Image of High Times magazine article explaining the origins of 420 and its relevance to Weed Day: Big. Assets.HuffingtonPost.com, All Rights Reserved. Green lion image credit: FreeWallpapersInn.Blogspot.com, All Rights Reserved. Green lion partners logo: Green Lion Partners, All Rights Reserved. Man smoking a joint: Wikimedia Commons, All Rights Reserved. Image of a bag of weed: Mat Lee for aNewDomain, All Rights Reserved. Image of young man smoking: Mat Lee for aNewDomain, All Rights Reserved. Image of cannabis plantation: OutsideOnline.com, All Rights Reserved. Donald Trump or Bernie Sanders: Any Suggestions?